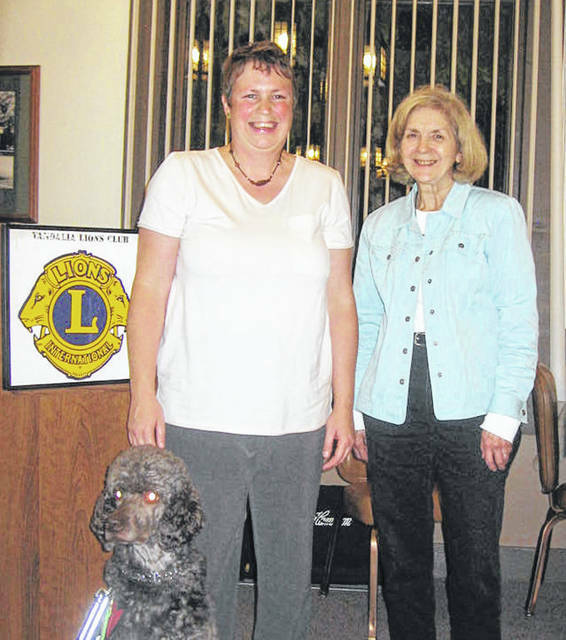 Pictured is Jenni Lough Watson (left) with Lion Program Chairperson Dee Smith. VANDALIA — Jenni Lough Watson, from Tipp City, spoke at the September 27 dinner meeting of the Vandalia Lions Club. She talked of the training and performance of Medical Service Dogs. Also, she has personally been accompanied by a Medical Service Dog for 17 years to assist with her Diabetes problems. The dogs are trained to “zero-in” on a specific medical condition by detecting a change in the handler’s body chemistry and then alerting the handler who then can take appropriate preventative action. One of her dogs “Ace” was also shown in a film clip finding her car, which was parked 2-3 blocks away. She noted that this takes extreme concentration by the dog, so people shouldn’t try to talk to a working dog.